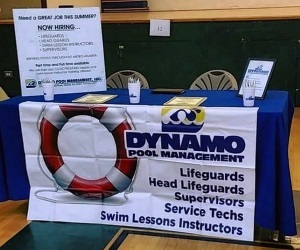 Dynamo Pool Management recruits individuals for our summer and year round locations from local high schools and colleges. We pride ourselves on recruiting the “best of the best” in lifeguards, any who train with Dynamo or who already have several years of experience. Dynamo Pool Management is able to provide your facility with trained and supported guards who have the skills to effectively manage your pool and oversee the safety of your patrons. Dynamo Pool Management is hiring certified lifeguards, head lifeguards, area supervisors and service techicians in order to staff local seasonal as well as year round locations. Online information applications are welcome at any time. Come work this summer or year round with us at Dynamo Pool Management!! Dynamo Swim Lessons utilize a fun and imaginative approach to help students create a life-long love for swimming. We are committed to helping reduce the number of childhood drownings by teaching children how to swim as soon as they can learn to walk. All Dynamo swim lesson staff are CPR/Lifeguard certified. Swimming programs are offered for infants through adults, conveniently in your neighborhood outdoor pool. Dynamo on-site swim lessons provide a great opportunity for your facility to offer your members and community classes to learn to swim or refresh swimming skills. Dynamo Pool Management offers convenient courses in Lifeguard Training, CPR/First Aid, and Swim Instructor Training at our main Chamblee and Alpharetta facilities. Dynamo Pool Management is fully equipped to handle all payroll and payroll taxes for all DPM staff assigned to your facility. DPM employees utilize a state-of-the-art automated clock in/out system and therefore all payroll matters are conveniently taken care of for you. We are even able to provide you with specific details should you request this at any time.